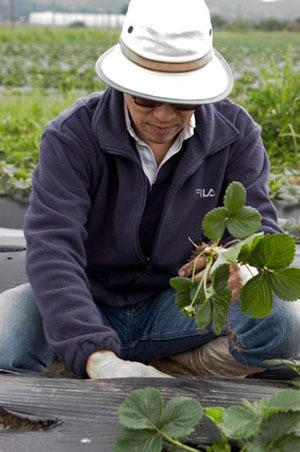 UCSC associate researcher Joji Muramoto works with strawberry growers to develop sustainable organic farming methods. Researchers at UCSC's Environmental Studies Department and Center for Agroecology and Sustainable Food Systems (CASFS) will use the four-year grant from the U.S Department of Agriculture's Organic Agriculture Research and Extension Initiative (OREI) to expand a network of farmers, researchers, UC Cooperative Extension personnel, and local non-profit organizations. It builds on a project that began seven years ago to investigate ways to increase and improve organic production for the Central Coast’s high value strawberry and vegetable crops. Particularly in strawberry fields, where organic growers cannot use methyl bromide or methyl iodide to control soil diseases, research will compare various ways of controlling soil-borne diseases and pests with organic methods. The grant is the second largest of 23 totaling $19 million by the USDA to promote research into organic and sustainable agriculture. Since the late 1990s, organic production has seen significant growth in the U.S. Producers are increasingly turning to certified organic farming systems as a potential way to decrease reliance on nonrenewable resources, capture high-value markets and premium prices, and boost farm income. Today, according to the USDA, more than two-thirds of U.S. consumers buy organic products at least occasionally, and 28 percent buy organic products weekly. The central coast network will work to identify issues that growers face in terms of producing crops organically while protecting natural resources, devise research to address the issues, and then disseminate the results to growers and others. Joining Shennan as the project’s principal investigators are associate researcher Joji Muramoto of UCSC, soil scientist Alex Gershenson from San Jose State University, agricultural economist Karen Klonsky from UC Davis, and entomologist Sean Swezey from UCSC, along with UCSC research associates Graeme Baird, Diego Nieto and Janet Bryer, CASFS social issues researcher Jan Perez and CASFS field production manager Liz Milazzo. The project also involves collaborators from CSU Monterey Bay, Oregon State University, Cooperative Extension personnel and more than a dozen local farmers. Research will look into ways to optimize soil fertility with organic soil inputs and cover crops to support good crop yields while protecting waterways. It will also compare various crop rotations to measure the effects on soil and crop nutrients and identify ways to minimize nutrient losses into the environment. UCSC researchers have already made progress over the past five years in controlling soil diseases with organic measures using a technique known as anaerobic soil disinfestation (ASD), which creates a temporary low-oxygen environment in the soil. The USDA grant allows the work on ASD to continue and expand. Members of the UCSC team will also continue to work with local growers on effective organic methods to control lygus bugs, a major strawberry crop pest, and address ways to control insect pests of brassica crops such as broccoli and cauliflower. Because organic production techniques must also be economically sustainable, researchers will study the economics of various organic approaches to control pests and optimize soil nutrient levels. Research will take place on the UCSC farm, which is managed by CASFS, along with various other organic farms in the region and on farms in the Santa Barbara area. A major focus of the project is also to ensure that the new information reaches farmers by using innovative web-based extension methods as well as field days, workshops and demonstration trials, and production of information sheets on fertility management, biological pest control, and rotation design.